One of Pennsylvania's greatest challenges in the decades following the American Revolution was to link the people and cities along the Eastern seaboard to those on the frontiers west of the Allegheny Mountains. The Endless Mountains that stretched diagonally across the state divided east from west, and made travel hard and time-consuming. Unpaved roads and difficult mountain passes made it impossible for the natural resources and farm products of the western frontier to reach eastern markets. To tap into the great wealth that lay beyond the Alleghenies, the state and nation needed a good road. Demand for a road to the west began in the 1730s, when western settlers lobbied the Pennsylvania Assembly for a way to carry their goods to market and receive essential supplies in return. Land speculators also supported such a route, realizing that it would greatly enhance the value of their western lands. But Virginia, which also claimed the territory in what is now western Pennsylvania, beat them to the punch. In 1750, members of Virginia's first Ohio Company hired Christopher Gist and Thomas Cresap to explore their lands and seek the best route for a road. Cresap employed a Delaware Chief named Nemacolin to mark a path for a roadway, which eventually followed an old Indian trail. The British military also saw the advantages of a western road. In 1755, British General Edward Braddock, accompanied by a young George Washington, constructed a military road from Cumberland, Maryland to Ft. Duquesne, which paralleled Nemacolin's route. But these were never more than crude trails. Albert Gallatin, by Rembrandt Peale, from life, 1805. Pennsylvania also received a free road thanks to the British military. In 1758, General Charles Forbes marched on Fort Duquesne (present-day Pittsburgh), which Braddock had failed to take. This time, however, the British and colonial forces cut and marched their way from Bedford, Pennsylvania, rather than Williamsburg, Virginia, along a path they called Forbes road (The path roughly parallels Route 22 and ended at what is now Forbes Avenue, a principal thoroughfare in Pittsburgh.) Washington tried but failed to convince Forbes to follow Braddock's route, a path that would have made the west more accessible to Virginia rather than Pennsylvania. American independence brought renewed calls for a better road to the west. Revolutionary War veterans wanted it to facilitate their settlement of tracts they had been given as payment for their military service. Farmers and traders needed a roadway to carry their products east and manufactured goods and other essentials to the west. And government officials wanted it to build the nation's economy and prevent westerners from turning to the Spanish and their great "national road," the Mississippi River, or to the British in Canada as trading partners. In 1784, George Washington traveled through western Maryland, Virginia, and Pennsylvania to explore the best routes for a trading route and to examine his own western landholdings. 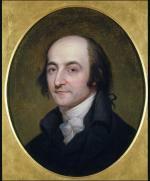 While lodging near present-day Morgantown, West Virginia, he met a young surveyor Albert Gallatin, who advised Washington on possible routes for a road that would connect Washington's holdings on the Potomac and in Alexandria Virginia with settlements in the west. Eighteen years later, Gallatin, now President Thomas Jefferson's Treasury Secretary, proposed that states exempt federal land sales from taxation and earmark a percentage of the proceeds for road-building "first from the navigable waters emptying into the Atlantic to the Ohio, and afterwards continued through the new states." Gallatin's idea, presented in a February 2, 1802 letter known as the "Origin of the National Road," was soon incorporated into the laws of Ohio, Indiana, and Illinois. But what path should the road follow? Gallatin, perhaps influenced by the fact that his own lands on the Virginia/Pennsylvania border were nearby, chose a route that closely paralleled the military road opened by George Washington and General Braddock in 1754-55. Thus, it would be linked via the Potomac River to Baltimore and Washington rather than by land to Harrisburg and Philadelphia. 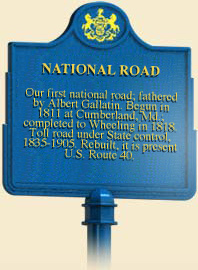 Authorized by Congress in 1806, the National Road was to be financed entirely with federal funds. Construction began in Cumberland, Maryland, in 1811. Seven years later the road reached the Ohio River at present-day Wheeling, West Virginia. From there it pushed on through central Ohio and Indiana, reaching Vandalia, Illinois in the 1830s, a distance of 600 miles. The National Road, funded by the national government, only passed through a short stretch of southwestern Pennsylvania, but it had a tremendous economic impact on Uniontown, Brownsville, and Washington, which evolved into commercial and industrial centers. Uniontown became the headquarters for three major stagecoach lines that carried passengers over the National Road. Brownsville, on the Monongahela River, already a prominent site for boat and barge building, became a center for steamboat building and river freight hauling. Taverns, blacksmith shops, and livery stables also sprang up in many small towns and villages to service passengers and freight moving along the road. The arrival of railroads in the mid-1800s drew traffic away from the National Road. By 1860 the stage-coach lines had closed, and the inns and taverns that dotted the route had been converted into private homes. Having lost its traffic to the railroads, the National Road became part of the local road networks. In the 1920s, some of the old roadbed of the National Road was folded into US Route 40, today one of the nation's great scenic highways. Timothy Crumrin, "Road Through the Wilderness: The Making of the National Road," The Magazine of the Midwest Open-Air Museum Coordinating Council (1994). Karl Raitz and George F. Thompson, A Guide to the National Road (Baltimore: Johns Hopkins University Press), 1996.